While there are infinite number of ways to make and styles to attempt there are basically only three varieties of cutting boards: face grain, edge grain and end grain. Face grain is the easiest and also the least durable. Having said that, some of the prettiest boards are face grain and if the board is properly cared for it can last for ages. As an example, my father made a board for my mother when they first got married. That was 73 years ago. My brother still uses that board – I can tell you it was not “properly” cared for and it looks a bit rough – but still on the job. Fair warning – those of you who are well into learning may be a bit bored with what follows – but I was asked for simple—- soooooooo….. off we go. I am going to make a couple of assumptions – one that you are going to start with good lumber. 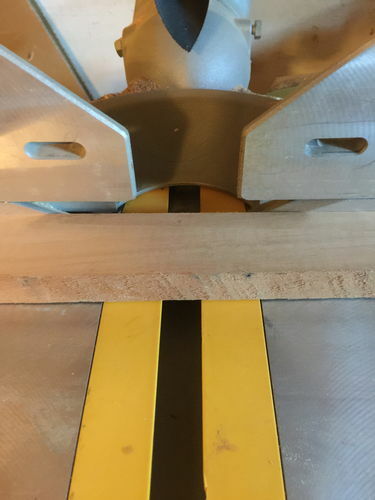 I sold my jointer long ago because the darn thing scared me – couldn’t get past it so I made a conscious decision that I would pay extra to get surfaced lumber – so I’m not the best to teach preparing lumber for working. But the very basics are you need lumber that is flat and straight. That said, I do not turn my nose up to a board that may have a bow or a twist. 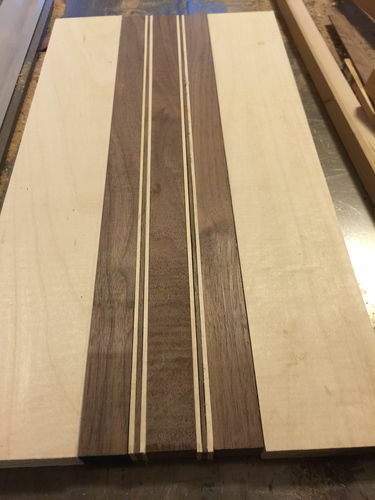 A long board with either of those “defects” can be handled without a jointer for a cutting board – often simply cutting the board into sections will do the trick – if it’s a bad warp or bow – I draw of line down the center and cut it on the band saw – also a good work around. However, I will only buy a board like this if it has some type of grain pattern that is really striking. I also, do a little bartering with the yard to see if I can take that defective board off their hands – it works – sometimes. An Internet search will provide more than your fill of how to prep lumber either with hand or power tools. YouTube alone will keep you busy for quite some time. Of course, just because it’s on YouTube doesn’t mean it’s worth watching. I’d probably stick with the magazine web sites to get the best information or the larger bloggers, such as The Wood Whisperer. Another thing about buying lumber for me is that I can’t carry eight or ten foot boards. So I have the boards cut down at the yard to generally 3’ or 4’ pieces. That alone saves me a lot of time. Not many cutting boards I make are going to call for lumber longer than 3’ so it’s not a problem. 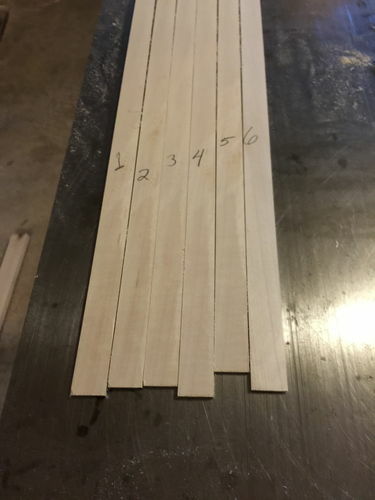 My preference is 3’ sections – but if I know I’ve got some face grain boards to make I can use that 4th foot on those boards. First off – I apologize for the poor photography and formatting – I’ve got to relearn a few things. 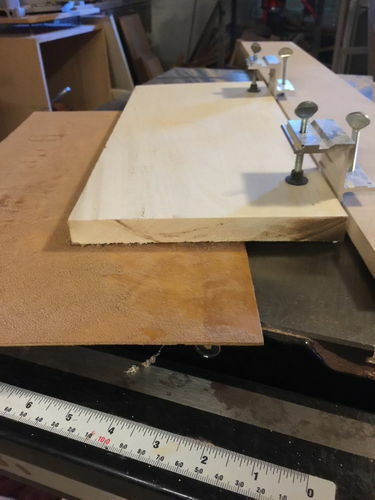 I usually make face grain boards from scrap – and these boards will have mostly scrap – but the maple I wanted to be very clear/clean so I used a piece cut from a longer board. First a little tip to take care of. Cutting your pieces to length is not just go to the chop saw and chop away – it could be – but not worth it. The first photos just shows that you put the cleanest edge of your board against the chop saw fence. Notice in the next picture the fuzz from the cut. 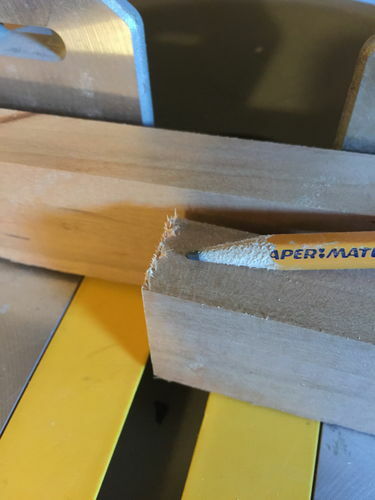 That’s because I didn’t use a backer board on the chop saw. 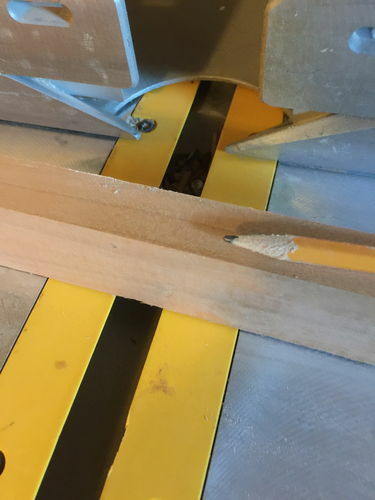 You’ll see that now the pencil is pointing to a clean edge that will sit flat to the table saw fence. The board I’ve cut for the 2 sidepieces of maple has a rough edge on both sides but one is straighter than the other – but not perfect. 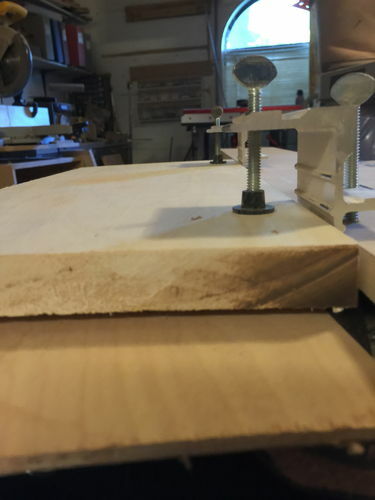 As you will recall – I do not have a jointer so I have to have a way to make one straight edge. Because one edge is rough but straight – I will place it against the fence and cut the other rough and not so straight edge. I know it might be hard to believe – but it took me a little while to learn to save time when setting the fence to the blade to make that straight edge. I would just slap the board against the fence and move the fence toward the blade until it hit the edge of the blade and cut. It didn’t always happen that the board would be cut clear through – that’s because one end is usually skinnier than the other. 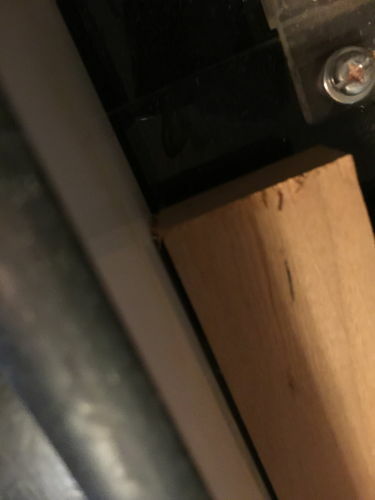 The second picture shows the other end with a gap between the blade and the edge of the wood. 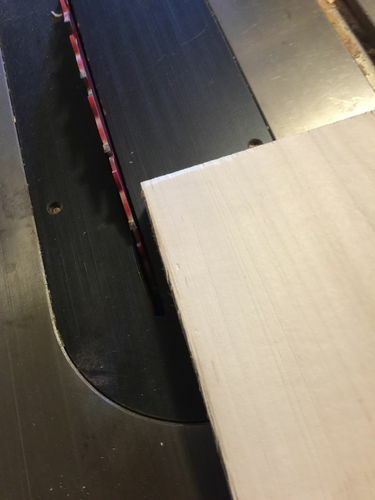 So, long and short on this point – put the skinniest end of the board against the blade and you will get a cut clean through the entire length of the board. This made a clean straight edge on one side, I then flip the board edge over edge and cut a small portion off the other side and I’ve got two straight edges. 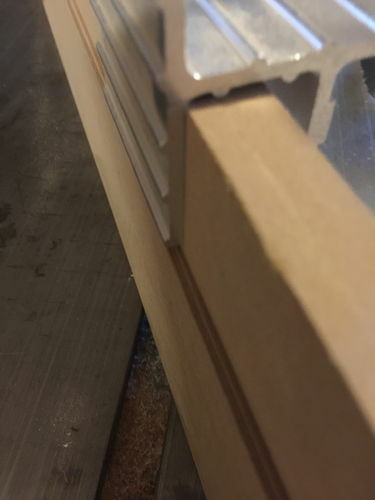 For those boards that I have two funky edges neither of which are near straight I use a clamping kit such as: http://www.rockler.com/e-z-jointer-clamp-kit. Here is my set up to use this jig. My jig board is long to accommodate many different projects. The clamps should be moved to about 2” from either end of the work piece. The next photo is an attempt to show the ledge you need to create on the back of the board to allow the clamps to set flat. You have to cut the board on edge with your saw blade run up. It’s an easy cut but you need to be careful with your measurement. I will admit to not being 100% sure I have the clamps the way they are intended to be used/set up – the instructions are sketchy. Regardless, you can see in the next picture that the board, once tightened in the clamps, leaves the board not sitting flat on the tabletop. 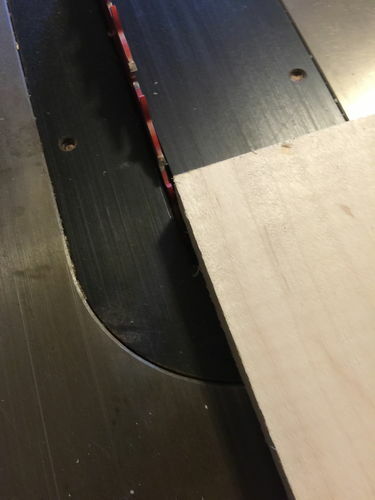 Now you can cut the edge like this – but you will not get a square edge and you’ll chatter the board all the way through the cut. The chatter is a disturbing sound. To fix this issue and avoid that chatter, I place a scrap piece of ply under the board. 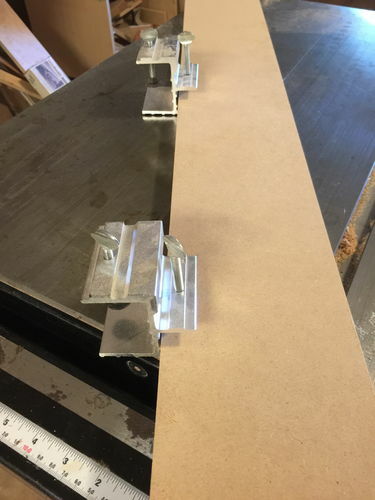 One thing to be careful of – is you don’t want the spacer ply to be under the clamps themselves – that will give you more than the support than you need and you end up with an clean edge with a slant the other way. This jig is easy to set up and easier still to use. After I get my first edge – I lay that edge up against my saw’s fence to make sure it is straight then just run it through the blade. Generally it’s right on the money. Okay – that’s my spiel on lumber prep. It’s much more involved then that if you buy rough lumber but, again, I’m not the one to explain all of that. As to the board I’m making I selected a piece of maple that was clear/clean that was wide enough to accommodate both 3” pieces and left enough to cut the 1/8” pieces. The wider walnut pieces are 1”. You have probably noticed in my pictures that I do not have a blade guard on my saw. Generally I don’t run without the guard, but the fact of the matter is – I busted it moving lumber around – don’t ask – it wasn’t pretty. I’ve ordered a replacement. It’s always better to use a guard or in the very least a riving knife (which is also missing from the pictures – but that’s another story). Without a blade guard with pawls you have to bet aware of the dangers involved. Such as pushing the board through the blade and once the cut is finished but not through/past the blade – if you pick up your push stick/move your hand releasing your hold on the board – it will become a missile and fire right back at you. The force of that board coming back can be tremendous. I’ve never had the issue but I’ve seen the bruises on others and it’s not pretty. The same can happen with your off cut. In the situation with no pawls I always use a featherboard. 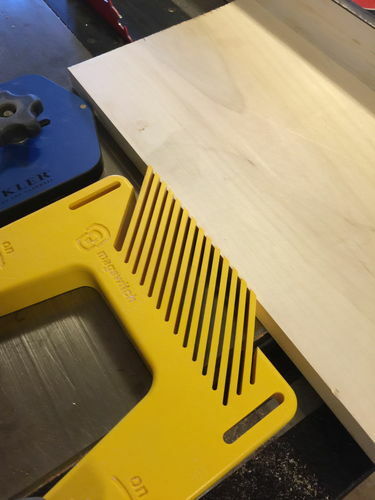 The following quote from http://www.rockler.com/how-to/why-use-featherboards/ provides a good explanation of why you should use featherboards. The whole article is worth a read. “Using a featherboard also offers safety benefits. Because of the angled orientation of its fingers, when a featherboard is set up to apply a gentle pressure, it will allow stock to move easily in the direction of the cut while all but preventing movement in reverse. 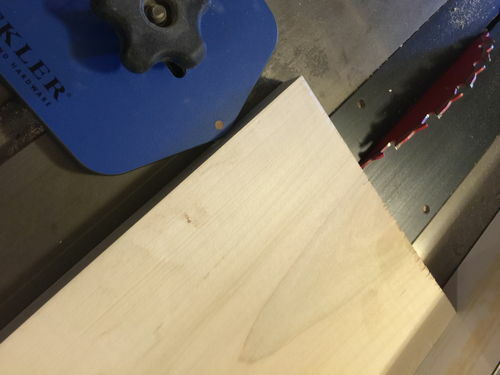 And while it should be noted that they are not a replacement for the riving knife and anti-kickback pawls that now come standard with most tablesaws, featherboards do provide significant kickback insurance” (emphasis added). There are many articles on the net about featherboards, how to make them and how to use them but the above quote sums it up pretty well. I use a featherboard with magnetic hold-downs that work great. But like the woodworkers we are you can make your own and come up with all kinds of variety. 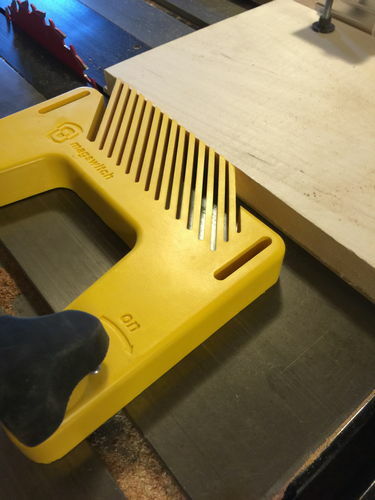 I addition to using the featherboard always finish the cut by pushing the board all the way past the blade. To cut the 1/8” pieces I used a jig. You can make your own jig but mine is store bought. I dislike making jigs as a rule, but I get a lot of gift cards from friends who really have no idea what to buy a woodworker who has everything else she needs, but can always use another tool or gadget, and I use those to buy jigs that I simply don’t want to make. It’s a crummy picture and it’s hard to see that the blue jig has a small ball bearing (which spins) that you use to place your board against (opposite the blade) to help give you repeatable, same width cuts. 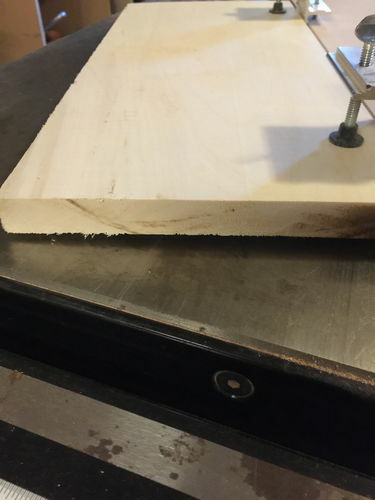 I use this jig get multiple thin strips. The ball bearing provides a positive stop and also allows the material to move easily through the cut. I still use a featherboard. 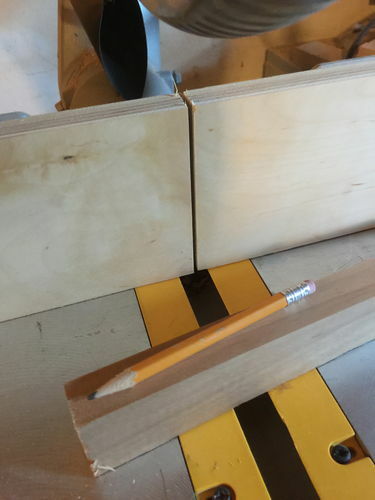 This is a much easier and safer way to make thin strips. Trying to cut them next to the fence is not the best idea. The thin strips come out pretty much perfect – the only issue I’ve ever had with thin strips is getting a lot of fuzz on the edges. It’s pretty simple little swipe with a piece of sandpaper – but there’s probably a way to avoid the fuzz but I’ve not tripped over it. My OCD requires that I number every piece – in some instances that’s a good thing. Tomorrow I’ll go through how I glue and clamp the board. I hope the above is of some help to you in your adventure. If it’s too simple and drawn out – please let me know. Thanks for taking the time to do this. I appreciate it. Informative blog…..I’ve already learned a few new “tricks.” Thanks.